Lurline's Place: Stars & Sprigs! I am improving so much as the days go by and I'm feeling so great it is the perfect day to start Stars & Sprigs by Kim McLean. I can't thank you enough Kim - please join us on the journey. I'm sure you will hear a lot more as it progresses. Apparently the quilt originated in 1810, now here we are 200 years later sharing the beauty! I believe the pattern will be on release to the public in a few weeks - oh, what a delight for you who love applique and reproduction! Janet of Quiltsalott is on a very speedy journey and oh, how beautiful it is! For those who don't follow Janet's blog - it is a true delight! Pop over and have a little visit! I have chosen an antique white Paddo for the background and French General Rural Jardon for the background behind the stars - we will use lots of pretty, bright reproductions for the applique - with maybe a few rogue fabrics thrown in. Please God, let me keep well - let's not worry about the necessities, but I would really love some joy and relaxation stitching - I have come up with a perfect ( I hope !) pattern for the Clamshells (lol)! I went for a lovely long drive north of Perth yesterday and my arms survived beautifully, touch wood they stay that way - I have missed my independence so much! Just lovely looking forward to seeing how it all turns out! Oh I just love this design so much! I'm looking forward to watching yours progress. I'm waiting for the pattern release with baited breath, although admittedly I don't know when I would actually sew it up. Yay for your drive out! I will hope for your continued well being and health. Everyone needs their independence after all. Lurline it looks great and I have been following Janets progress. If the pattern is not out yet how are you guys able to work on it? love your plan for this quilt, sounds pretty! This will be a beautiful quilt! Glad to hear that you are getting better, and I hope that the improvement continues to show! Gorgeous start you have made. Glad you are here and enjoying some improvement in your situation to allow you to enjoy the things you like to do best. Wishing you a weekend filled with all your favourite things. Glad to hear you are improving...we miss you! 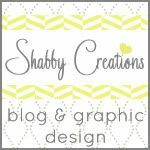 Your stitching is inspiring as always! I'm constantly amazed at this quilt on Quiltsalot. I'll be enjoying it on your blog, too. So glad to hear that you are healing and on the road to recovery. This is a fabulous quilt and I am sure that your choice of fabrics is going to be superb. Will be looking forward to seeing your progress. Looks like you are off to a beautiful start! You must be feeling better to undertake such a new challenge. Hurrah! I'm so glad you're feeling a bit better. I love your fabric choices for this quilt. I will enjoy watching your progress! I hope it's all good and getting better from now on.. I am very happy to hear you are feeling better and back sewing with joy again. What a magnificent quilt you are making! I look forward to watching your progress. Lurline, it's so wonderful to hear such positive things about your improvement. Your little peak is enough to let us know that the end result is not only going to be historical, but very lovely. I found it interesting that you "touch" wood. Here, we "knock" on wood, and if there isn't any close by to knock on, we knock on our head. It's very lucky that I have a wooden head, lol. 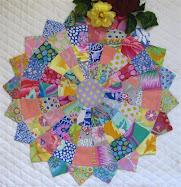 I am pleased that you are feeling much better and the new applique project is sure to keep you bright and cheery. I have been watching Janet's grow on her blog and am now looking forward to watching your journey. Its a beautiful quilt. Glad that you are feeling better and I love that pattern! Lurline, I am so thrilled to hear you are getting better. We hurt, when a fellow quilter is down and cannot enjoy their passion, fabric, thread, etc. I do so love the new quilt project. You are so tempting me to at least order the pattern. Maybe in retirement? We shall see...hugs to you. So glad you're back to stitching Lurline .... and lovely to see you back in blogland too :o). Keep on improving :o)!!! 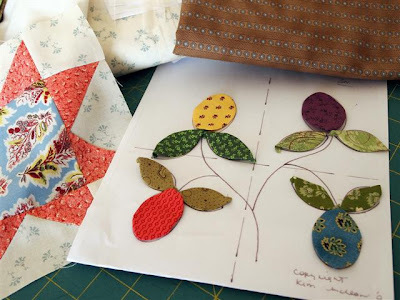 I've been following Quiltalot's progress and wondered if the pattern would be coming out at some time .... glad to hear that it is. I'm hoping that you will not have any health problems so that you and we can enjoy seeing your blocks as you do them up! Oh what a lovely, happy, joyous post! I'm thrilled for you and all of us that can share in this special moment in time. The good times and the not so good - we're here!